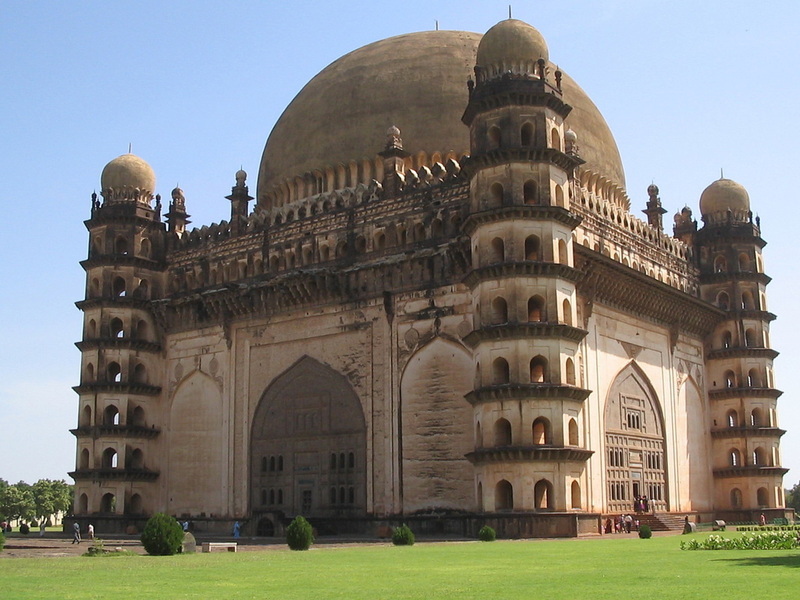 The Gol Gumbaz is the mausoleum of Mohammed Adil Shah. It is one of the largest single chambers ever built. Externally, the building is a great cube with a turret or tower attached to each angle, with a large hemispherical dome covering the whole. The effect of the building is derived from the fine proportions between its various elements, especially between the cubical part below and the domed part above. Subsidiary elements include the wide cornice supported by closely spaced brackets. Above this is an arcade of small arches, their formality broken by their skillful spacing. Above this is are the massive merlons with finials which break the skyline well. Above the merlons are the foliations around the base of the dome concealing the junction between the dome and the cube below. The wall surface of the cube has three arches sunken into them, the central one paneled out to bring it to the size of a normal doorway. The width of each of the sides is equal to the height which is a little above 200'. The exterior diameter of the dome is 144'. The interior of the structure is a single large hall, one of the largest ever built, measuring 135' across, 178' high and the gallery from where the dome springs is 110' from the pavement. The main architectural features of the hall are the tall pointed arches which support the dome above. The arches have their bases within the sides of the square plan while their planes of surface are at an angle, the intersection above forming an eight sided figure on which the circular cornice is projected. The dome is set back some 12' from the inside of this cornice so that some of its weight is transferred onto the four walls, while the rest is projected onto the intersecting arches which also receive and counteract any outward thrust. 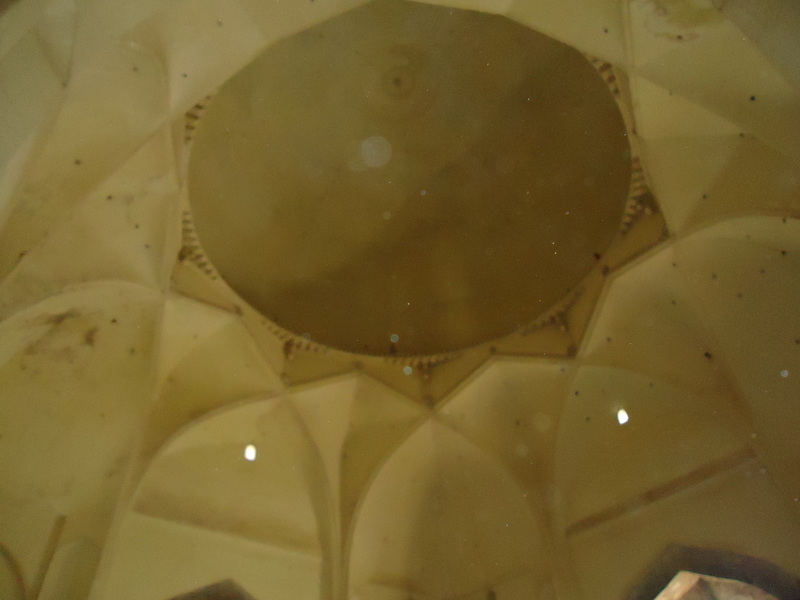 The dome is a plain plastered vault with six small openings through the drum and a flat section at its crown but no central pendant. The dome consists of horizontal courses of bricks with substantial layer of mortar between them. In other words, it consists of a homogeneous shell of concrete reinforced with bricks, the whole being of a thickness of 10'. Due to the system of oversailing courses of brickwork, timber centering would be unnecessary, hence it was probably not used in the construction of the dome except in the section near the crown. The system of supporting the dome on intersecting arches was something the Bijapur masons were surprisingly familiar with as this system is almost unheard of elsewhere, the only other example being on a much smaller scale, in the sanctuary cupola in the cathedral of Cordova in Spain, built some six centuries earlier.